Providing valuable content to your followers and customers is one of the main goals of any Inbound Marketing strategy. Everything from SEO rankings to customer research depends on the content your company puts out. With so many platforms to manage (social media, blogging, website, etc. ), it can be hard to keep track of what needs to get published when. Implementing a content calendar can help solve this issue and keep your marketing strategy on track. Studies show that almost any platform you use to publish content will provide a higher return the more often you produce content. The recommended blogging frequency is 3 to 4 times a week to see a return on time spent and the recommended social media posting frequency for most platforms is 5 times a week. This rigorous posting schedule is not a waste of your time. Studies show that keeping up with a frequent posting schedule will increase website traffic, lead generation, new business, and sales. However, keeping up with all this content can be difficult without proper planning and preparation. One of the biggest areas we stress when designing an Inbound Marketing strategy is that the content you produce must be valuable. If you are producing 6 blogs a week, but the content is irrelevant to your subscribers, you will quickly lose credibility and followers. A content calendar allows you to sit down a month, three months, or six months in advance and plan out the topics you want to discuss. We’ve previously talked about how to choose a blog topic and the same thought process can be put into developing this content calendar. What is the goal of these posts? Why would our target audience be searching for this topic? Is this social media post going to draw viewers back to our site? By sitting down and planning out your content ahead of time, you can ensure that you are consistent on your website, blogs, social media accounts, and more. This does not mean you need to or should be posting the exact same content everywhere. It just serves to ensure you are planning out your messages in advance and that they are consistent across all platforms. A big part of consistency in posting is being sure your posts target the correct keywords and buyer personas for your marketing goals. After you have created a buyer persona for your ideal customer, you should know what types of things they will be searching for online. You can then track these keywords and create posts that are related to information your ideal customer will be searching for. This will allow you to be sure your message is consistent and targeting the correct audience. When you have a place where all your posts have been scheduled and documented, it is much easier to track the performance of your posts. For example, if you had holiday themed posts, you could use your calendar to see if posts performed better when published closer or further away from the holiday. Although you can measure each post individually, it is much more efficient to look back and compare it when you can see all the details around the post as well. Another way to track your posts' performance is by seeing the amount of clicks and conversions your CTAs, landing pages, or content offers got from a post. By documenting where each post leads, which CTA is associated with it, or by linking it to a topic cluster, you can track each post's performance and determine if anything needs to be changed. Once you have planned out your posts in advance, there is an element of accountability you place on yourself and/or your team. Seeing a schedule written down with pre-selected topics makes it much harder for you to procrastinate or put off your posts. Writing down your tasks and topics will also make it easier to produce content. You don’t have to come up with a different topic every day; you already know what you will be writing or posting about each scheduled day. As we’ve mentioned before, posting often and being active on social accounts is really worth your while. Multiple studies show that the more often you post, the better your return on time spent will be. By planning out your posts in advance and writing them down, you have a better chance of meeting those recommended 3 to 5 posts a week. By using a content calendar to track due dates, publish dates, authors, and subjects, you will be able to stay on target for your predetermined posting schedule. A team calendar will allow the whole team to stay on track and hold each other accountable. Planning your content in advance gives you plenty of notice to create your posts. You won’t be scrambling last minute to create a social post or a blog article. You will already know exactly what you will be writing about and can work ahead of time to craft a valuable and well-thought-out post. Social posts that are planned ahead are even easier because you can schedule them in advance using a number of different tools. Once you know your posts for the week or month, take an hour or so to create and schedule them all in advance. You have then saved yourself time in the long run and given yourself a little wiggle room in other areas. Tracking where each post will be published on a content calendar will help you be able to correctly schedule each post successfully and quickly, which will allow you more time in your day. These days, everyone has something to say. To stand out from the crowd, you must be producing valuable content at a consistent and frequent rate. By doing so, you will be increasing website traffic, gaining new business and leads, and even impacting sales. The best way to produce this level of content is to take the time to plan ahead and produce a content calendar to keep track of what you will be publishing. This will allow you and your team to be on the same page and keep your message organized and consistent across all channels of communication. And hey, it might just save you some time too! As you can see from the photos above, we use a content calendar template to keep track of all published posts. 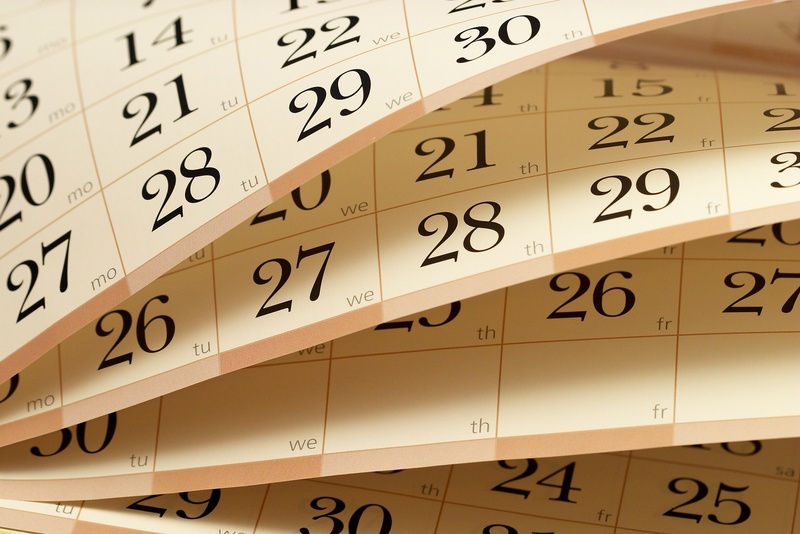 Download our free Content Calendar template to get started tracking your own posts!